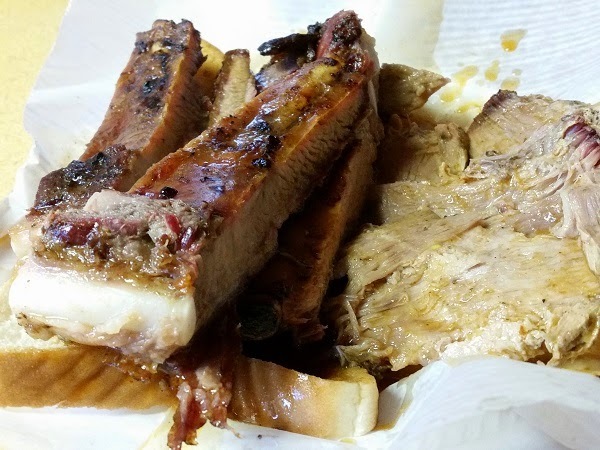 Archibald’s Bar-B-Que, Northport AL – Marie, Let's Eat! There are, of course, hundreds of barbecue restaurants this side of Texas that we have yet to visit, but it’s fair to say that we have not heard about most of them yet, and that there are only a handful left with a huge reputation – a “you must eat here” footprint that most everybody in the barbecue hobby knows. Payne’s, Sweatman’s, and Stamey’s come to mind, and so, for a long time, did Archibald’s, which has been on my short list for about five years thanks to so many glowing reviews from the regulars at the Roadfood forums. The first time we drove through Tuscaloosa, in 2011, we visited the better-known Dreamland, and on my second trip through – on my first “circumnavigation” – I deliberately chose a pair of not-as-well-known joints. Archibald’s had to wait until our third visit. So why did we return to Tuscaloosa last month? Well, credit the state’s tourism department, because The Year of Alabama BBQ is a terrific initiative, and, over the course of March and April, we visited three new-to-us restaurants that are also on their list. Once I downloaded the app, I remembered that it really had been a long time since I wanted to visit Archibald’s. We also had a desire to spend a little more time and focus on Alabama, and also wanted to let the girlchild, who’s beginning to start thinking about her college future, spend a little time walking around a campus, looking for the closest-to-perfect vibe for her. More about that in the next chapter. So I had a day trip scheduled for quite some time – even before we nailed down everything on the previous two trips – and on a really pretty April day, we hit the road early and pulled into Archibald’s a few minutes after they opened. Incidentally, one terrific rumor about Archibald’s is true: you literally drive up behind a house, up a residential driveway. This led Marie to a short moment of eyes-widened confusion, because this can’t be the right driveway. But the smoke pouring out of the huge chimney quickly settled the question. The building is the definition of ramshackle. They recently enclosed one side of it, giving a narrow room with three small tables on the other side of the counter. Previously, most guests ate outdoors on picnic tables. George and Betty Archibald opened this place in 1962, and their son George Jr. and daughter Paulette Washington run it today. It’s a very simple and basic menu: ribs, sliced pork shoulder, mayo slaw, and beans. The meats are served drowned in an orange sauce that’s so good that even after you’ve sucked all the meat from the bones, you’ll gorge on bread and sauce. It’s not really unlike the terrific Dreamland sauce, but it has an even greater tang to it. The sliced pork is pretty good, but the ribs are the things to get here. They are amazingly flavorful and peppery and some of the absolute best anywhere. They might have been worth the wait, and worth the drive, but I’m still kind of aggravated with myself for waiting so darn long. Completely delicious, they’re worth driving here from any neighboring state. The beans and slaw are kind of so-so; don’t waste the calories. A trip here is all about the ribs, smoked in that incredible stack. Any other meal you have this day might well be excellent, but it will still be in Archibald’s shadow. We’d like to encourage all our readers to have a look at The Year of Alabama BBQ site and consider a trip here this year. There’s a whole lot of great, great eating to be found. 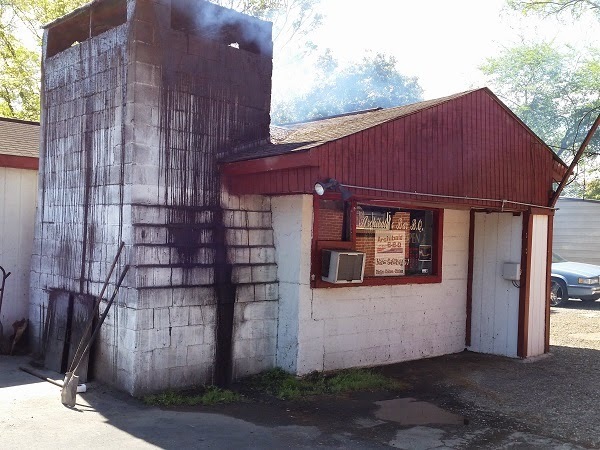 Check out our own barbecue list for at least 45 Alabama suggestions. Posted on May 12, 2015 August 21, 2017 by Grant G.Posted in alabama, barbecue, roadfood, tuscaloosaTagged alabama, barbecue, roadfood.com, southern belly, tuscaloosa. Archibald’s and Payne’s and Stamey’s and Sweatman’s are also on my barbecue bucket list. I can’t wait to take a big road trip one day and hit a few dozen shacks. Your blog has given me lots of good ideas. Oh, I’m glad! I hope when you take the trip you have a great time…and tell us all about it! Great post. Would love to get here but I fear it will be several years away at best due to me or the family never making it to Alabama. I’ve got it! You and Speedy go out and visit Rudy in Texas. You can hit all sorts of places on the way there and back! You are absolutely right! Archibald’s ribs are the best I’ve ever had. I don’t know what they do, but I’ve eaten there ten or eleven times and loved every visit.